Bender, aka Bend In The Line, is an 8½-year-old white and red male born November 4, 2005. His sire is Betty N Ed and his dam is Bettor Smile. Bender was not a candidate for further schooling as his body form is not kept straight when he runs. 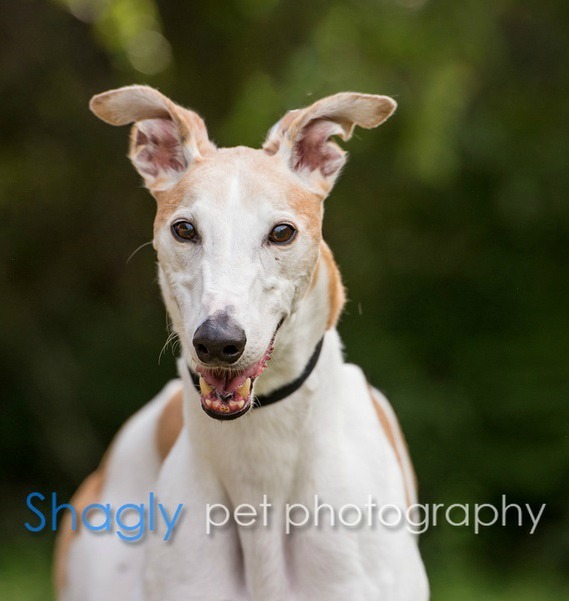 Bender, who was called "bright eyes" at the farm, is very personable and loves to be petted! 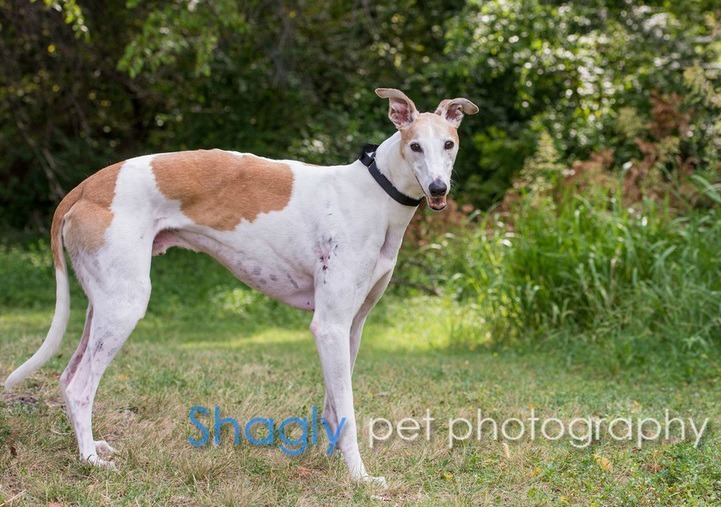 Bender was in a home for seven years along with Willi, but has returned to GALT due to a change in family circumstances and no fault of his own. Bender is small dog tolerant, has passed a cat test and is living in a foster home with cats. Bender is a sweetheart! He’s housetrained and can hold it all night, but he enjoys going outside a few times a day, so a dog door or someone who is home to let him out would be good. Bedtime is a favorite time for him, and he likes to sleep on a dog bed right next to the side of the bed. He eats well, and quickly – sometimes a little too quickly! He also tends to get bad gas occasionally, but a probiotic is helping with that. Bender is good about napping on the dog beds, but sometimes sneaks up on the couch. He loves to sleep rolled over on his back – right in the middle of all the noise and activity in the house. He loves to take walks and walks well on leash. Bender does not like the crate, but he's been very good left loose in the house with his greyhound foster sister. He gets along fine with our small mutt and cat as well, and he's good with kids.